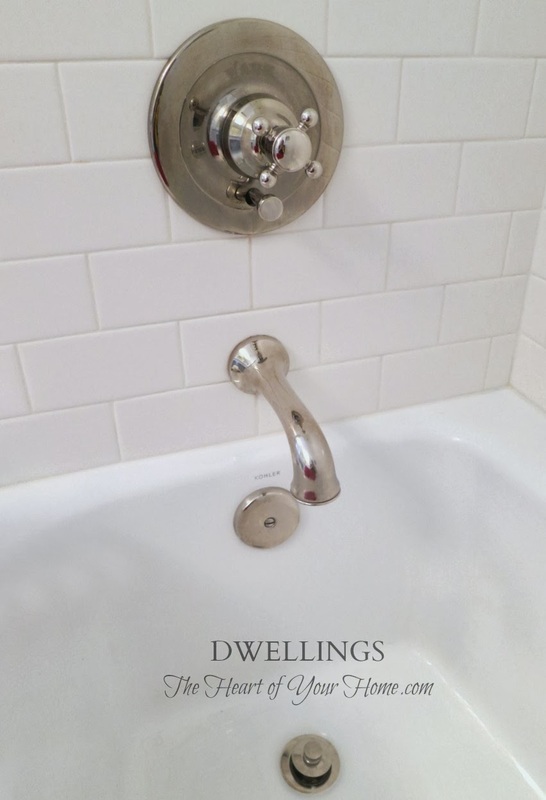 There isn't much I would change about our guest bath. We still have a few things to do, like finding a vanity stool and choosing what to do with the walls. Leave them painted as is, paint another color, or put up some wallpaper? But we are happy with our choices so far. 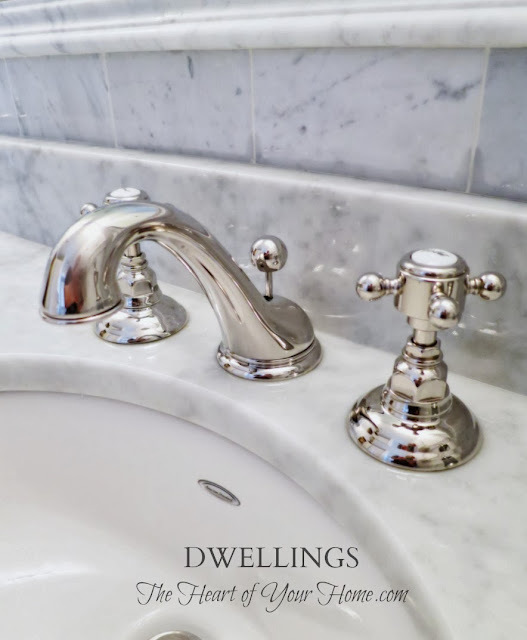 as well as the Rohl plumbing fixtures. It is hard to take pictures of this room because of the size so the angles always look a little funny. the one below is with the lights off. and pretty much stay this way with occasional use. But when family moves in for a few months, things change a bit. 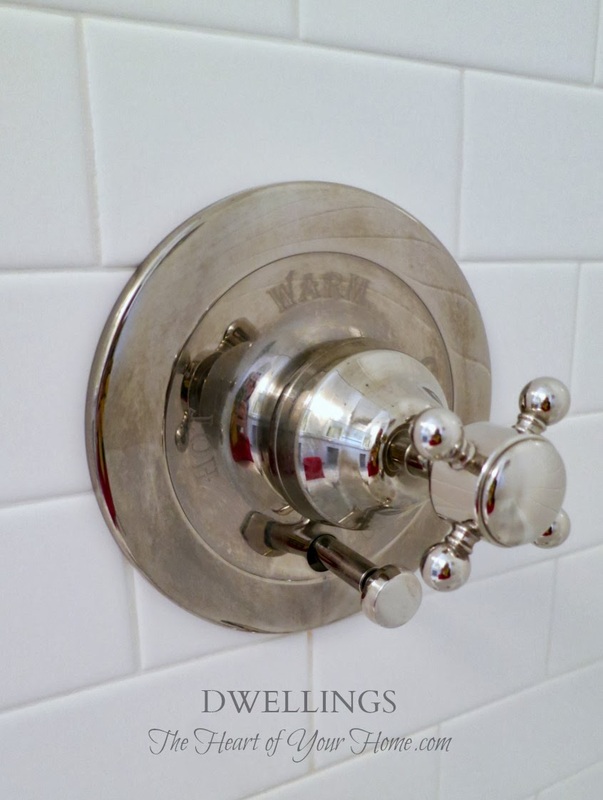 What I had read about polished nickel prior to choosing it for our guest bath fixtures, began coming true. 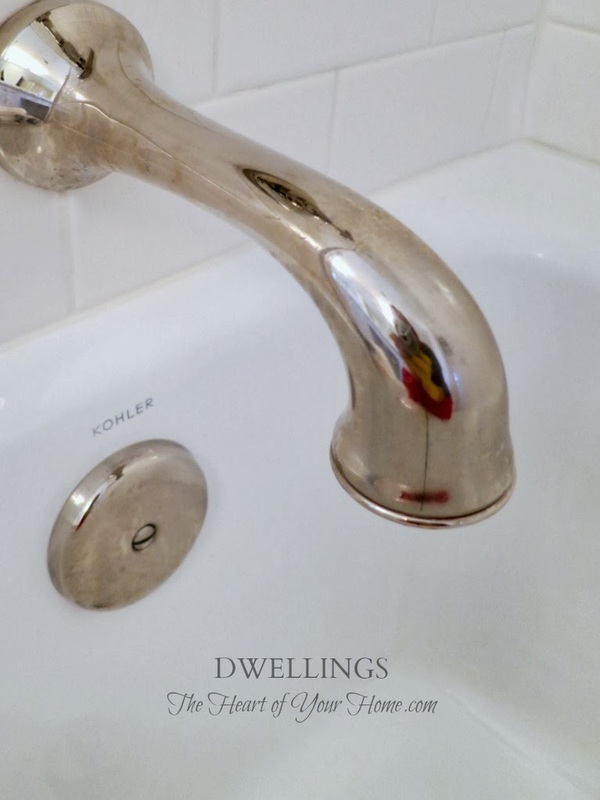 Polished nickel needs a bit more attention than chrome fixtures do. How about now, easier to see? 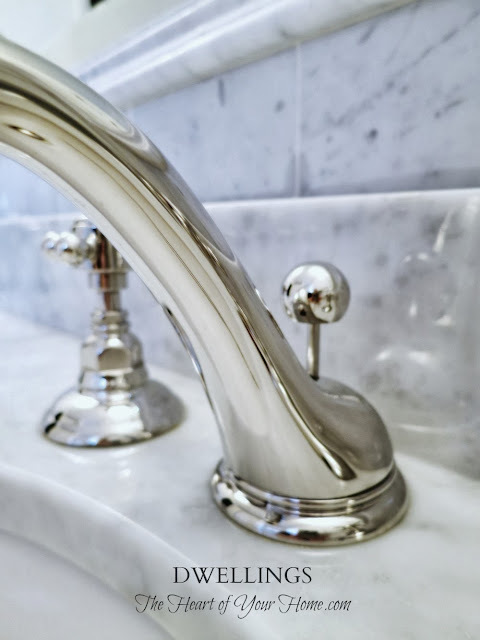 This discoloration and spotting happens when polished nickel fixtures are used on a daily basis. but preferring things to look nice and shiny I had to figure out how I was going to do. Well, let me introduce you to my new helper, Flitz! Flitz is a polish paste, so you know what I'm going to say next...right? Yep, the dreaded wipe on, and then rub, rub, rub it in. And then wipe it off, buffing to a shine...just like polishing silver. Nope, no fun at all! 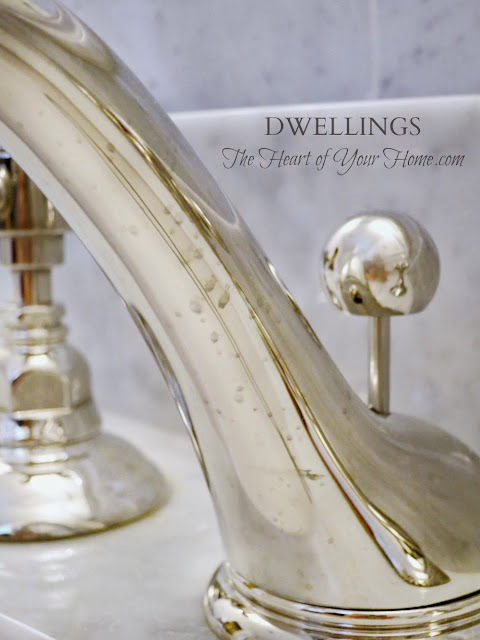 I am so glad to have found a way to keep polished nickel clean and shiny. There is nothing prettier than polished nickel fixtures and I am still glad we chose it, but a little FYI if you are thinking about this finish in your bath or kitchen. 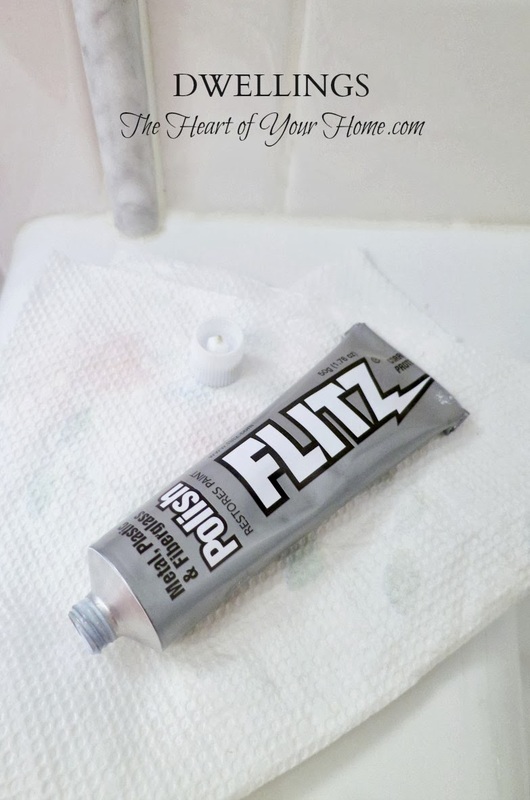 on the countertops, on the floor, or in the shower. How about you, any tips to share? It's party time, so hop on over for AMAZE ME MONDAY! Wow! 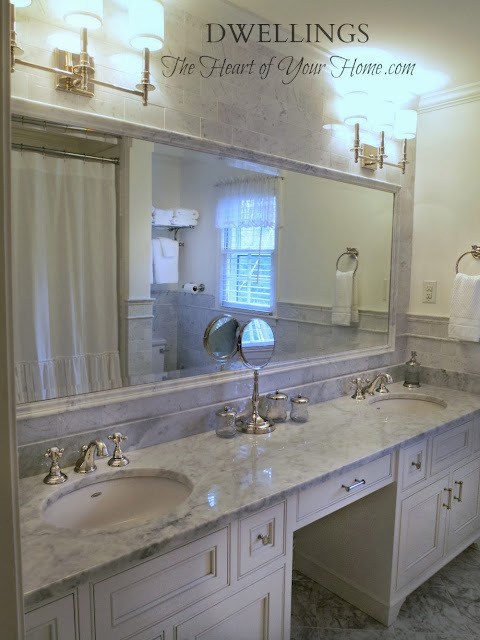 Your bathroom is gorgeous Cindy!!! Love it!! I love the nickel finishes too.. You are so right they get spotty very quickly. I have never heard of this product...interesting... Stainless steel....blah! I hate keeping it clean.. Any suggestions for stainless steel.. it is a monster!!! I always wanted stainless steel in my kitchen and now that I have it.... I am not a fan.....Blessings! Hi Cindy! 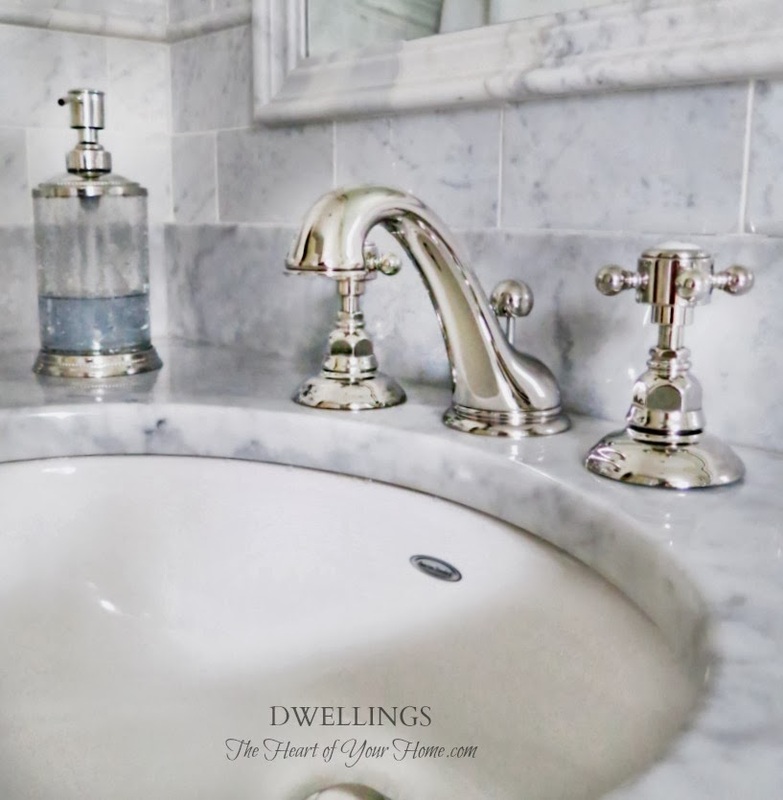 Your bathroom is so lovely and how great to know there is a way to get the spots of the polished silver faucets! :) You're just the smartest one! That bathroom just couldn't be any prettier. Those spots would drive me crazy though. Glad you found something that works. Does it help reduce the spotting also? Oh my gosh - your bathroom is STUNNING! I am in love with everything about it. Sigh. Great tip on how to make it look super polished! I love the look of the polished nickle, but I'm much to lazy for the maintenance. Just gorgeous, Cindy. So well done! What a great product! And your bathroom is simply gorgeous! I love the counters and the area above the mirror. I wouldn't let wallpaper fight for attention with that although I was going to recommend it. Wallpaper is becoming popular once again and some of it is stunning. Thanks for the tips!! 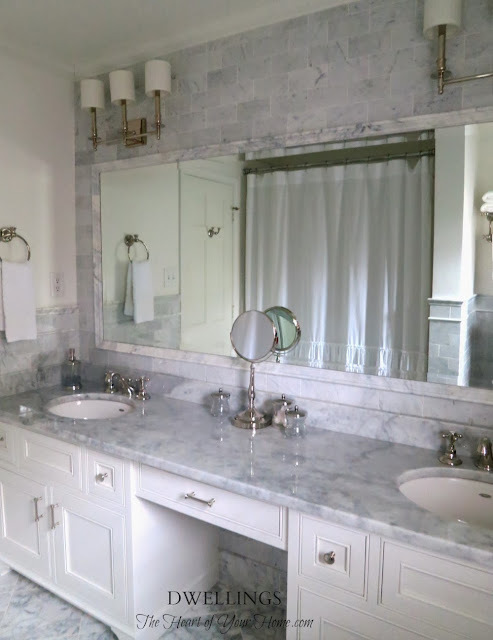 Your bathroom is gorgeous. I am curious as to how the marble will hold up to the family moving in but marble is gorgeous even as it ages to me. I guess we got polished chrome because I haven't had any spotting and ours is used on a daily basis. 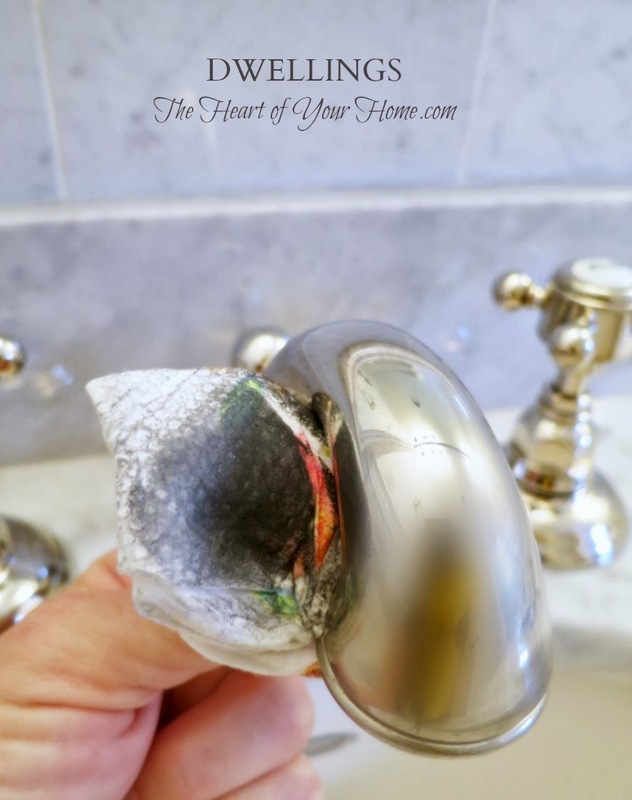 You found a great solution to getting it pretty again. looks great after shining it up. love the marble too. That bathroom is absolutely gorgeous! Oooh yes, even if it's a bit more work, it is undoubtedly gorgeous. LOVE this room! I LOVE your bathroom! It's gorgeous! I am going to give that product a try. We have really hard water where I live, and it would be useful. Great tip! Gorgeous bathroom Cindy!!! Cindy this bathroom is so beautiful. Your guest bath is gorgeous. I know your daughter and son-in-law enjoyed using it while staying with you recently.